With 1:12 to play and the Lions trailing by three points, wide receiver Ronald Smith caught a pass from quarterback Anders Hill and raced 63 yards down the middle of the field for the game winning touchdown as Columbia defeated Princeton 28-24 Saturday at Powers Field at Princeton Stadium. 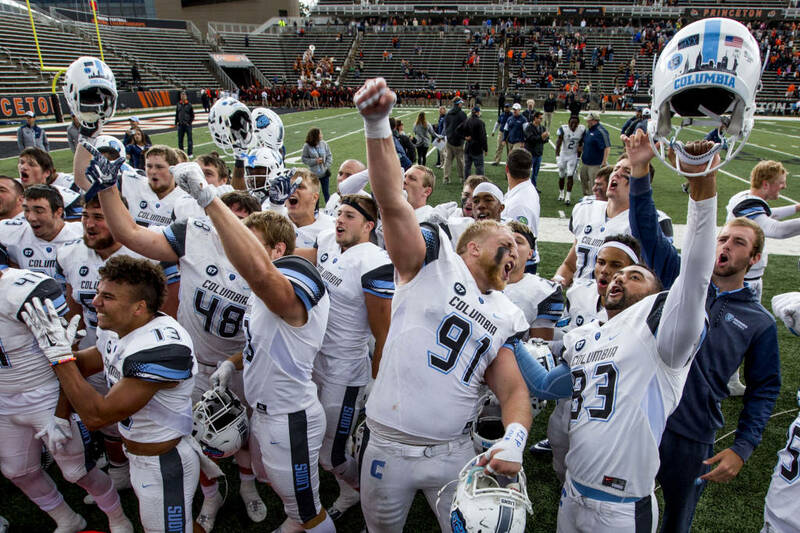 The victory gave Columbia its first 3-0 start to a season since 1996, its first win in an Ivy League season opener since 2010 and its fourth consecutive victory and longest win streak since 1996. Smith finished the game with a school and stadium record 236 yards receiving on 10 catches including two touchdowns and Hill threw for career-highs of 400 yards and 27 completions along with two touchdowns. Columbia’s defense also forced four Princeton turnovers including three interceptions and a fumble recovery and stopped the Princeton offense three times in the red zone. Jeffrey Kordenbrock’s 43-yard field goal as time expired lifted Lafayette to a 10-7 win over Holy Cross in the Leopards’ Patriot League opener. The victory marked the first career coaching win for head coach John Garrett and was the first for Lafayette in the final minute since 2009. The Lafayette defense stood out all afternoon, coming up with big stops again and again, including in the fourth quarter. There was none bigger than 4th-and-1 at the Holy Cross 33 when Brandon Bryant stuffed Diquan Walker for no gain. A replay showed the officials’ spot was accurate following Bryant’s 15th tackle of the game and the Leopards took over on downs with 1:43 left in regulation. The Saint Francis Football team earned the biggest win in program history on Saturday, with a 13-7 win over No. 22 Liberty. The Red Flash battled for all four quarters, holding the Flames scoreless for the 57 minutes of the game. Saint Francis improved to 3-1 overall, while Liberty fell to 3-2. The Red Flash earned the program’s second win over a Top 25 team, joining it’s 30-27 win over No. 24 Sacred Heart on October 25, 2014. Liberty is in its FBS-transition year before it makes the jump to the 85-scholarship level next year. Liberty opened the season with a 48-45 win over Baylor, a Big 12 school. Saint Francis totaled 275 yards on the day, including 183 passing and 92 rushing. SFU helped itself by committing no turnovers. The Elon University football team continued its hot start to the season behind a strong defensive effort that saw the Phoenix record its first shutout since 2009 as the maroon and gold blanked the Albany Great Danes 6-0 in CAA Football action at Rhodes Stadium on Saturday afternoon. Elon improved to 4-1 for the first time since that 2009 campaign and is 2-0 in CAA Football play for the first time ever. Albany saw its three-game winning streak snapped and sits at 3-2, 1-1 on the year. Winning at South Carolina State is only supposed to be pretty when it shows up on the left side of the standings column. The North Carolina A&T football team played another hard-hitting, ugly, defensive slugfest at Oliver C. Dawson Stadium against the Bulldogs that resulted in the Aggies (ranked 13th in the NCAA Coaches Poll and 17th in the FCS STATS Media Poll) improving to 5-0 overall and 2-0 in the Mid-Eastern Athletic Conference with a 21-7 win. The Aggies have now won three straight at S.C. State for the first time since the 1998, 1999 and 2000 seasons. It is also the second time in as many trips to Dawson Stadium the Aggies have held the Bulldogs to under 10 points. That has not happened since 1969 and ‘71. The Aggies were 9-6 winners in 2015. Austin Peay State University football’s first two victories of the 2017 season featured high-octane offenses obliterating everything in its path. Saturday’s win against 18th-ranked UT Martin was a little different. We’re getting historical with the wins now. The win is Austin Peay’s first against a ranked foe since toppling 20th-ranked Eastern Kentucky at then-Governors Stadium, 24-20, Oct. 24, 2009. It’s the first time the Govs have taken down the Skyhawks since 2007. The last time the Governors shut out a Division I opponent was against Middle Tennessee in 1986—a 7-0 overtime affair that was the last victory in a three-game winning streak, which Austin Peay is now on for the first time since 1986. The last regulation shutout of a DI foe was against Murray State in 1980. Tenth-ranked South Dakota used four scores from quarterback Chris Streveler to build a 38-6 lead and held on late to secure a 38-33 road win at No. 16 Western Illinois Saturday afternoon at Hanson Field in the conference opener for both teams. The Coyotes (4-0, 1-0 MVFC) moved to 4-0 for the first time since 2006 and won their third road game, also the most since that season. Western Illinois (3-1, 0-1), fresh off three impressive road wins, lost its home opener for the first time in eight seasons. The No. 5 Youngstown State football team turned in an impressive team effort in a 19-7 win over No. 4 South Dakota State on Saturday evening at Stambaugh Stadium. The Penguins, who extend their home winning streak to 11 games, improve to 3-1 overall and 1-0 in Missouri Valley Football Conference play while the Jackrabbits fall to 3-1 overall and 0-1 in the MVFC. Youngstown State dominated the time of possession, 45:14-14:46, and outgained the Jackrabbits, 448-222. The Penguins defense allowed just 65 yards on the ground and came up with two big turnovers in the first and fourth quarters. Armand Dellovade had four tackles, including a safety, and an interception in the fourth quarter. When you win a top-5 showdown, you sing that fight song! A year after losing to Sam Houston State by 36 points, the University of Central Arkansas Bears solved a mystery that no team in the Southland Conference had since 2015 by knocking off the Bearkats 41-30 before a packed house at First Security Field at Estes Stadium on Saturday night. The No. 11/12 Bears (3-1, 2-0) broke the Bearkats’ 12-game SLC winning streak and handed them their first loss of the season (3-1, 1-1). Instead of trailing 38-10 at halftime like it did in 2016, UCA grabbed a 31-17 halftime lead behind three touchdown passes by senior quarterback Hayden Hildebrand and a pair of interceptions by senior cornerback Tre Smith. Weber State used a big third quarter and strong late game defense to defeat Montana State 25-17 on a rainy Saturday afternoon at Bobcat Stadium in Bozeman. The win moves the 18th-ranked Wildcats to 4-1 on the season and 2-0 in Big Sky play. It’s the first time WSU has started the season 4-1 since 2003. It was also Weber State’s first win in Bozeman since 2008.